Who will win, E46 or Focus ST? As you may have seen a couple weeks ago, RightFootDown.com released part 1 of a 2 part series comparing the Focus ST and the E46 M3. Well the finale is coming very soon (imminent even), as we recently wrapped on some final shots. Make sure you subscribe to our YouTube channel to see part 2 and a whole lot more coming up soon! Below is our ace photographer/cinematographer Josh Taylor getting some final footage of the vehicles after I finished saying the same lines over and over and over. I can say one thing with a fair degree of certainty - Making car films is hard! 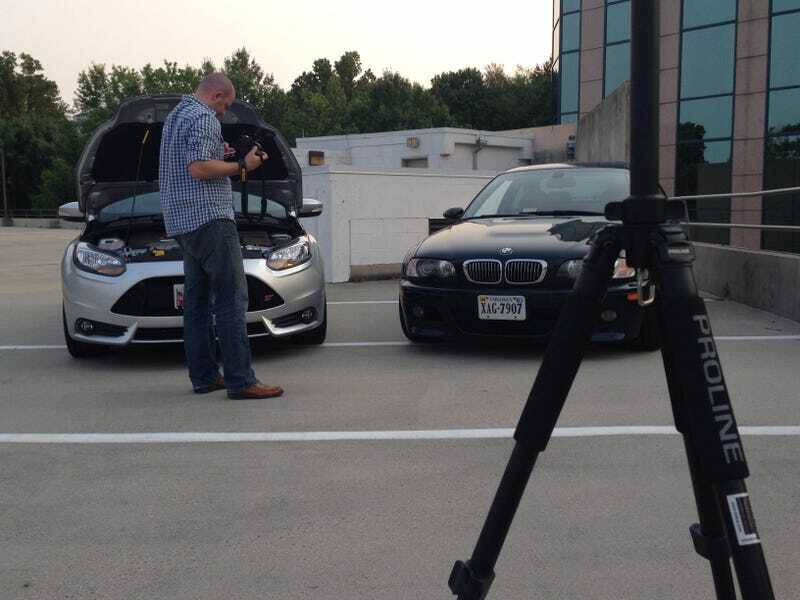 Whether it's simple technical stuff like making sure all the audio and video equipment is on and adjusted to the right setting, getting the perfect angle on a shot, mounting and remounting cameras on the car(s), or managing how much light is on the host (me) and the cars, it takes much longer than you expect. For these two ~10 minute segments, we shot a few full days worth of film. Whatever you estimate, double it and add a few hours. So I fully respect how great the professional stuff looks even more now. But, a word of warning to those aspiring Clarksons, Harris, and Farrahs out there. As a host, you have to have thick skin to read comments on the interwebs. I got called a douche a LOT (which was entertaining) and got a lot of "jeez I could do better" comments to which I would encourage everyone to give it a shot. Because its also incredibly rewarding when a film comes together and looks the way you intended. Anyway, thanks for watching and keep an eye out for new content. I just got out of a Daytona Grey Audi S5 cabriolet. Getting to drive fun cars and write about it makes it all worth it.